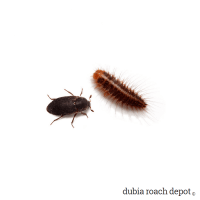 Cleaner crews help keep Dubia and other roach colonies healthy. They work alongside roaches to clear moist debris and other potential hazards that might cause problems if left unchecked. Dermestidae (D. maculatus) eat dead roaches while lesser mealworms (A. diaperinus) eat frass (particularly moist frass) and leftover food particles. 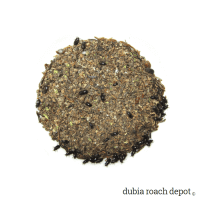 Both insects help decrease moisture in roach colonies. 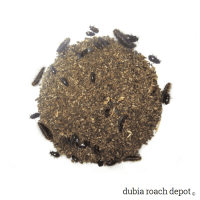 This reduces the chance bad bacteria or mold can take hold and harm your roaches. Either species can be deployed separately, but they can also be used in combination. In our experience, the combination of the two is more effective than either alone. 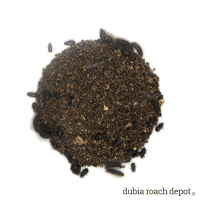 Dubia Roach Depot has the best service of any company or website I’ve bought Dubia roaches from anywhere on the Internet.